What are types of sessions do you offer? How do I choose? I want to ensure your family's portrait session is lots of fun for you & your children. Be ready to play however the moment & mood develop and be open to the spontaneity our location may provide. Children are not expected to perform...with your assistance, I want to capture the beauty of your family in its full spectrum...the joy, the smiles, the laughter and even a toddler's crying meltdown. Beautiful memorable moments will be captured in what otherwise would seem like chaos to non-parents. My most popular session is the Custom Photography Session, approximately 60 minutes in length. It is the session that most clients have experienced year after year. The length of time allows for ample time for both adults and kids to relax, have time to play, photograph different scenarios in various locations, "work" at a relaxed pace, etc. I love that the Custom Photography Session gives me more time to spend with my clients so that I can capture their full personality as a family unit. Alternatively, I offer a Day in the Life Session. This session is quite unique. It is approximately 3 hours long where I come to your home and I capture a day in the life of your family. It is candid, real life storytelling. Its amazing how much beauty exists in everyday family life. Lastly, periodically, I offer a day of Mini-Sessions for a handful of families. These types of sessions are 20 minutes in length, at a pre-determined location. I also offer sessions for Headshots, Empowered Portraits and Events. Please email me at erin@erinsilber.com for rate information. Sessions take place either at your home or at another location that is meaningful to you - whether that is a local neighborhood park, your local ice cream parlor, the Brooklyn Bridge or another special location. Its best to keep the location simple so that your family's special connection can be best captured. My session times book up quickly, so in order to secure your preferred session time & date, I request the sitting fee to be paid promptly in advance. Once your session is confirmed, I will discuss your expectations for your individual portrait session as well as learn more about your family, your goals for the session, your likes & dislikes and any special information that will help me customize your portrait session specifically for you and your family. What if we can't do our outdoor session on our scheduled day due to unforeseen bad weather or a child's health? Weather is unpredictable and, like life, we all need to be flexible. I am always in touch with my clients if the weather forecast does not look favorable. Typically, we collectively make a decision the evening before the session or the morning of a scheduled appointment to evaluate poor weather conditions and make back-up arrangements or rescheduling plans for your session. If a child is sick, I request that you inform me in a timely manner so that we can make the best decision for your family. We will easily reschedule your session so that the timing works for both of our calendars. Choose clothing that represents the personality of your family. If you and your family like to wear casual clothing or like to dress up...fantastic...I love photographing unique families. Please review my blog to see what other families tend to wear. Please note, we will be spending time together "playing" around, being natural and fluid so that your life's precious moments, expressions and love can be captured. When selecting your clothing, it is ideal to stay away from bold patterns and logos. If possible, try to keep everyone in similar tones. Muted colors work best. Bright colors often work well and are fun & vibrant too. And it is best to stay away from white or black clothing items. What if my kids do not cooperate? Kids are kids and they are perfect no matter what - so do not worry. Babies, toddlers and growing kids can be chaotic but my goal is to capture the personalities of your children including all of their beautiful quirks and expressions. I connect with my subjects easily, we play and have a good time and I always capture memorable portraits. What if I feel uncomfortable in front of the camera? Please do not stress. I have years of experience in portrait photography and know many techniques to put my clients at ease. I work hard to make the session as relaxed as possible so that unique moments in your family's life are captured and your family's personality can shine through. If needed, I’ll give you tips and guide you through the process...please do not worry...we will have a great time and you will look fabulous! Yes, I do. All portraits presented in the image gallery will be fully edited beautifully with my custom style. You will view your family portraits 1-2 weeks after our portrait session at our in-person Portrait Reveal appointment. This gives ample time to custom edit each individual photograph. I select the best images from your session; the quantity of images depends on the session's time length. Once the best portraits are edited, I will come to your home and present the photographs to you. At that time, we will go through the collection and pick your favorite portraits. The Portrait Reveal appointment is a great experience because it minimizes the feeling of being overwhelmed with so many portraits and also minimizes our overall email traffic….making everything more efficient. We will also figure out what you want to do with those portraits....whether you want to create wall art for your home (large framed prints or canvases for your walls), creating a beautiful coffee table book, loose prints for gifts, etc. How long do I have to make my selection for the print order? We make our very best efforts to decide on your print order at the end of the Portrait Reveal appointment. Timely orders are essential; it allows me to devote substantial time to each individual client and their specific needs. Plus, I want you to enjoy your prints or other specialty image items in your home as soon as possible! How will I ever decide on all the images that I love? There are so many options! 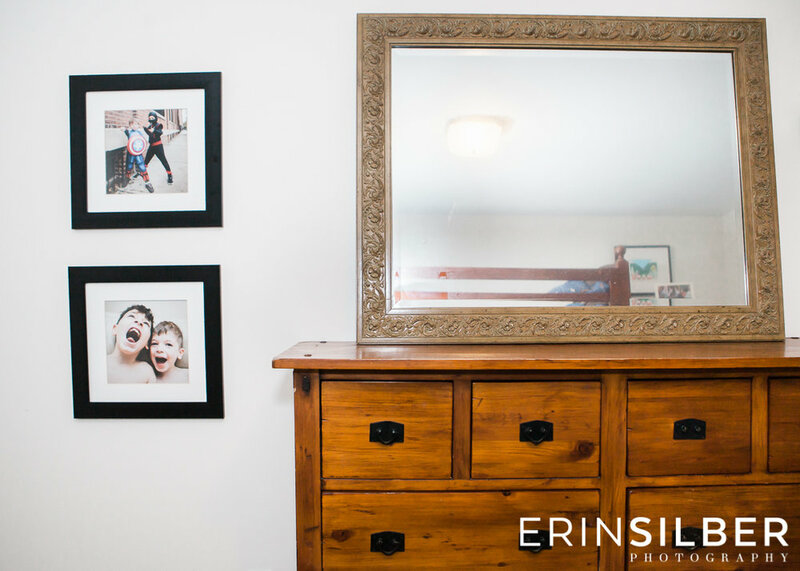 Because displayed family portraits effect children's confidence in such a significant way, it is really important to me to help my clients chose big prints or canvases for their homes. It is wonderful for the whole family to view the love and connection they have for one another as they walk through their home every day. In my small Brooklyn apartment, I have several large framed prints and canvases that my family and I truly cherish. Below are some of my large family portrait art pieces. How long should I allow for delivery of images/prints? Please allow 2-3 weeks for delivery of your prints, image products and/or high resolution digital files.